Mobile Internet SystemsMobile internet connectivity for service trucks, buses and other equipment. The SCADALink Mobile Gateway is designed to provide internet/WAN connectivity over a 3G/4G Cellular Network to 10/100-BaseT Ethernet and/or 802.11 b/g WIFI connected devices. This system allows Internet connectivity for service trucks, buses and other equipment. 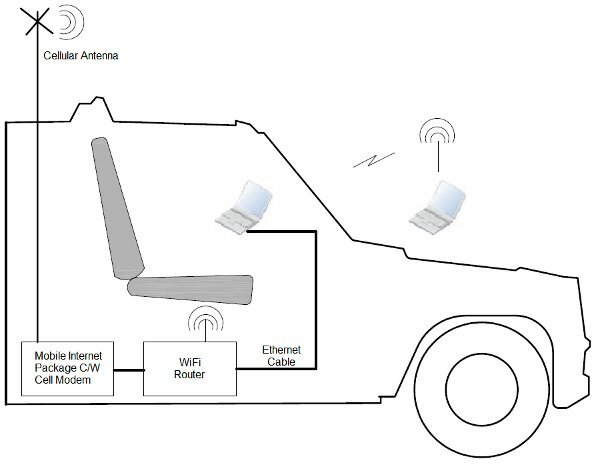 Remote Video Monitoring in vehicles to provide additional security for users or sensitive equipment.We produce package solutions to provide Internet connectivity for industrial use. Using cellular, our packages are ideal for situations where individuals who work at multiple rural locations need access to the web on a routine basis.Our Mobile Internet Systems are custom-designed and are built with rugged components. Each package is built with the customers work environment in mind. Additional elements such as web-enabled video monitoring or sensor monitoring for Oil & Gas applications can be added as needed.On some of our packages, an 802.11 b/g WIFI enabled router is included to provide a secure and wire-free way for multiple users to connect. This can be ideal for work crews or for vehicle fleets looking for value-added services to offer their customers.